Javier just turned 12 and is going to junior high next year. He wants to fit in with the older boys and start at his new school with a cool image. 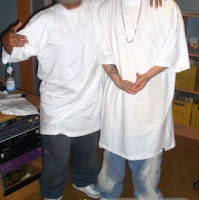 His older brother who is in 11th grade always wears big white shirts over saggy jeans or long khaki shorts so that he looks kind of like a gangster, even though he is not affiliated with any gangs. Javier doesn’t think about gangs he just wants to look older and get more respect like his brother so he decides to start dressing like him. He also starts emulating his brother’s attitude of being too cool for school and not showing much emotion. Ever since he started making these changes he finds himself getting in trouble more in school, and today his teacher sent him to the office for fighting even though the other kid was the one starting it and Javier didn’t do anything. Why do you think his teacher assumed he started the fight? Have you ever had someone misjudge you based on your appearance? What other negative consequences might Javier face if he continues to dress and act in this way? (consider law enforcement, actual gang members, employment opportunities etc) What positive consequences might he encounter, if any? Why do you think dressing like gangsters is so popular? How do you think Javier’s parents feel about his change in dress and demeanor? Do you think it is worth it to change the way you look and act just to seem older? Especially if you encounter negative stereotypes because of it? ** Brains are wired for imitation. Boys want to grow-up to be like their fathers, brothers, and other male role models in their lives. Children have a natural tendency to emulate older children because they look up to them, therefore they want to be like them. ** Baggy shirts and saggy pants, a trend which began in the prisons, has increasingly become more mainstream in our culture. Boys often feel they need to adopt this style of dress in-order to fit-in. Music, media, and the internet are filled with images of this style of dress. Popular artists, such as Lil’ Wayne and Eminem, gain a lot of attention for their style, making this also something that kids want to emulate. Kids may not understand the origins of these images. Those who begin dressing like this may also eventually want to repeat some of the actions of these individuals and my find themselves in trouble by doing so. ** Youth who are assumed to be affiliated with gangs or other negative groups are often treated differently, regardless of whether or not they are actually a member of that group. This could lead them to become apathetic and/or could actually cause the very same behaviors the law enforcement, parents, teachers, or other authority figures are trying to prevent. ** Kids who go against the social norms in their neighborhoods and at school can often become the targets of other kids. This can often make the kids feel as if they have to dress and act a certain way to avoid standing out in the crowd and getting picked on. ** Talk with your mentee about how their appearance is often assumed to be an outward reflection of who they are and, if they are dressing a certain way, like a “gangster,” it might be assumed that they are affiliated with the people who normally dress and act this way. Encourage them to dress to represent who they are and not who someone else is. ** Share with your mentee about times when you tried to dress or act a certain way to fit in and talk with them about how that affected the way others interacted with you. ** Talk with your mentee about their actions at school, at home, and in general. Discuss positive versus negative actions and ways in which they can make positive decisions for themselves and with others. Talk with them about staying away from fighting, drugs, and other dangerous scenarios and how, if they are part of one of these situations, even if they are not doing it, they could get into trouble by association just by being there. ** For kids who have siblings, talk with them about how they look up to their older siblings and/or how their younger siblings look up to them. Use examples if you have older or younger siblings. Talk about how they could be positive role models for younger kids, peers, and siblings (older or younger). For those who have older siblings, talk about some of the positive things the siblings are doing (playing a sport, getting good grades, helping others, etc). Discuss some of the actions of these older kids and what is and isn’t age appropriate for your mentee. Labels: clothing, dress, friends, gangs, image, What do you think? Jeannette decided she wanted to mentor after watching how the program made an impact on her son. Being the mother of two boys she looked forward to mentoring a young girl, and due to her lifelong passion of working with kids she was very excited to spend time with a child in need. In January 2011, Jeannette was introduced to her mentee, a painfully shy little girl in 3rd grade. Her mentee is the only girl in her family, and lives with three brothers. Her parents are divorced and work hard to support their kids, so they don’t always have time for them. Because of her situation, Jeannette’s mentee was very withdrawn and quiet, unused to getting much one on one attention that didn’t involve rough housing with her brothers. She was getting in trouble at school for not turning in her homework and desperately needed to work on her social skills. While Jeannette’s mentee was characteristically quiet during their match meeting she quickly started to warm up with every meeting until now, over a year later, Jeannette can't get her to stop talking! Over the past year, Jeannette and her mentee have participated in various activities, including talking about the importance of school and working on homework, to going to the beach with Jeannette’s family and coming to as many program events as they possibly could. Jeannette worked with her on so many different areas, provided unconditional support, and cherished every moment she got to spend with her mentee. Through Jeannette’s amazing warmth and commitment, her mentee has blossomed in one short year. We all look forward to seeing how much they will continue to grow together! Thank you for everything you do, Jeannette, and congratulations for being our January mentor of the month! You deserve it! Alicia is 13 and in 7th grade. She wants to start wearing make-up because she thinks it will get her more attention from her older brother’s friends, who are all in high school. She thinks the boys her age are stupid, but is interested in dating. She wants her brother’s friends to stop thinking of her as a little girl, so she thinks if she starts wearing eyeliner, mascara, and foundation that she’ll start looking like a high school student. Her big chance will be at a party on Friday night. Now with Facebook, if Alicia goes to that party, she knows that pictures will be posted that night, and wants to look good for the camera. She decides that will be her debut. Alicia convinces a few friends that they should all go buy make-up and new outfits for Friday, so they head out to State Street with a picture of their idol, Selena Gomez,from her new music video, and buy things to imitate her…big hoops, dark eye shadow and liner, and a short dress. Since Alicia hasn’t fully matured yet, she decides she also needs a push-up bra. 1. Have you worn make-up before? What have you worn, and when? Do your friends? What age do you think is too young to wear make-up? 2. Have you ever thought about “looking older”? What does that mean to you? 3. Why would you want to look older? What do you think you might accomplish through this? 4. Did you know that most TV shows that portray junior high and high school students have actors/actresses that are actually much older? (Selena Gomez is 20, the cast of Glee are between 20 & 28, Degrassi is set in Junior High, and they’re all 15-21). 5. What possible positive and negative consequences could come out of looking older than your age? What kind of guy might that attract? ** Girls are beginning to use make-up at an earlier age. From 2007-2009, the percentage of 8-12 year-old girls who use mascara rose from 10 to 18% and from 10 to 15% for lipstick. Neutrogena’s cosmetic director states that 75% of consumers ages 14-17 are using foundation on a regular basis. ** Television and Hollywood put pressure on teenagers to look much older than they really are. o The average age of the characters in the show “Glee” is 25 and two of the actors who play teenagers in the show “90210” are over the age of 30.
o Starlets under the age of 18, such as Taylor Momsen, are not only using make-up, but are wearing a heavy amount of it, along with clothing that might even be deemed inappropriate for adults, such as thigh-high boots. o With “The Kardashians,” “Jersey Shore,” and similar shows being part of popular culture, teenagers are seeing made-up, provocatively dressed, party-goers being labeled as “reality” television. ** Cosmetic and fashion brands continue to target teenagers, such as Neutrogena’s “Teen” line, scantily clad teenagers on the runway, and make-ups with names that sound like candy. ** Many pictures of models and celebrities use airbrushing and other techniques to give a false idea of what “beauty” actually is, making many young women feel as if they need to reach an unattainable standard of beauty. ** Current research is being done by the National Institutes of Health on the link between ingredients in make-up and earlier onset of puberty, with small connections already being made between the two. ** Teens with skin concerns may use make-up to feel more self-confident. Too much make-up or using products with certain harmful ingredients could end-up worsening their skin, as many cosmetics contain ingredients that clog pores. ** Teenage girls who try to dress and act older than they are may be expected to act the ages they are trying to portray, especially by older men they might encounter, which could potentially put them in dangerous situations. Teenagers have less of an ability to think ahead to the consequences of their actions and are often more focused on fitting in. ** Encourage trying some light make-up at home first and starting small (clear mascara, tinted sunscreen or moisturizer, and colored lip gloss). ** Encourage your mentee to check the ingredients in the make-up so they do not end-up doing damage to their skin or bodies. ** Talk with them about if they have considered how trying to look older might appear to others and if they have thought about what types of situations this could potentially put them in. ** Share your own experience with makeup and the positive and negative consequences you encountered when you first started wearing it. ** Talk with your mentee to see how much they have thought through potential situations they could get into and encourage them to think through potential consequences. ** Ask your mentee, if they hang out with an older boy, could there be differences in what she and him are expecting from the situation because of how she is presenting herself with makeup. ** Talk with your mentee about what characteristics of themselves they feel positive about, making sure they find at least one thing that has nothing to do with make-up or clothing. ** Talk with them about the difference between television and magazine images and real images and encourage them to find people who aren’t magazine images who they find beautiful. ** Talk with them about how their behavior, actions, and how they treat others show their inner beauty on the outside just as much as make-up. Labels: beauty, clothing, cosmetics, dress, fashion, girls, image, make-up, media, self-esteem, teen, What do you think? Angelina just entered 8th grade and has fallen head over heels in love with a 9th grade boy at the near by high school. He is so edgy and different that she worries she is too simple for him and he will never feel the same way about her that she does about him. Angelina knows that he likes girls that are counterculture and dye their hair or have piercings so she starts thinking about what she can do to be more like that. Her 22 year old cousin just got her dimples pierced and she always gets so much attention from boys that Angelina decides she wants to do that too. However, she is too young to get a piercing without parent permission so she chooses a sketchy shop where they won’t ask too many questions and begs her cousin to go with her and pretend to be her guardian. She knows that her parents would never allow her to do it but if she already has it done what can they do about it then? Angelina tells her cousin that she will say that she got it done by herself so that no one will get blamed, and her cousin agrees to help her out. They make a plan to go to the piercing studio the next day and Angelina is so excited to get her new sparkly dimples so she can show her crush. Do you think Angelina is making a good decision? What is she motivated by? Why do you think most teenagers get piercings? What are the potential positive and negative outcomes of getting her cheeks pierced? (Physical, social, financial, emotional etc) How could such visible piercings make her life more difficult now and later on in life? How will Angelica feel if her crush still doesn’t want to be with her even after she gets pierced? Have you ever changed yourself (appearance, actions) just to get a person’s attention? How did that work out? What do you think about her cousin’s part in this, is she doing the right thing by helping Angelina? What would you do if you were her? How will Angelina’s parents feel when she comes home with piercings? What do you think they will do? **Piercings have been around for centuries, and can have a variety of personal and cultural significance for a person. However, because teenagers are experimenting with their identities they may be drawn to piercings or tattoos as a form of expression, rebellion, or attention seeking. This may be especially true when a teen's friends have piercings or when role models they admire do. **Teenagers need to feel a part of their social network while also asserting their uniqueness and independence, and piercings are an increasingly common way to accomplish this. One or two piercings is considered normal and healthy while more than that could signify emotional or psychological problems, and might even be considered self-harm. **If you are under 18 you must have parent consent to get a piercing, otherwise the person who pierces you can be arrested on misdemeanor charges. Having someone impersonate a parent or guardian in order to give false consent is fraud and can be a felony offense. Contracting a disease such as HIV, Hepatitis C and D, or tetanus. Getting an infection at the piercing site which is not only painful and expensive to treat, but can cause scarring or permanent damage. **About half of piercings result in visits to the doctor’s office, and just seeing the doctor is not cheap. **First of all, keep in mind that a teenager desiring a piercing is very normal so when discussing it with your mentee by open and understanding. **Talk to your mentee about piercings, especially if they have expressed an interest in getting one. Be accepting of their thoughts on it because trying to shut them down will just make it more attractive. Share how you feel about it, including any personal experiences you have, but let them know you appreciate that ultimately its their body and their decision (with a parent of course). **Ask them what piercings they would want and why, and then discuss the pros and cons with them. Spend time talking about what is motivating their interest, because they might not even be clear on it yet. If you think it’s a bad reason tell them so, and explain why so they know you only have their safety and happiness in mind. The more seriously and calmly you take this discussion the more your mentee will listen, and because this could be a potentially life threatening decision they will need your advice. **Make sure they are aware of the health risks and the importance of proper safety and finding a licensed professional. Teenagers often feel invulnerable so this might be a good time to look at some picture online of piercing consequences (scarring, infection, skin problems etc). Going online will also give them a chance to show you pictures of how they hope it will turn out, and this might give you insight into why they want it. Emphasize how much aftercare and continual upkeep there will be for the piercing they have in mind. These are the things that teenagers don’t consider when getting their trendy belly button piercings etc. **Also talk to them about the financial implications of getting pierced, from the initial operation, to jewelry, to potential medical costs and insurance. **Help them consider the negative stereotypes associated with piercings that they might encounter, because while their friends might think its cool and cute, their boss might not. **If you really want to dissuade them from getting a piercing, try and find someone who had a bad experience that can talk to them about it, so that at least they will take the consequences more seriously. **If you are concerned that your mentee is motivated by more serious emotional or psychological problems caused by past abuse, depression, extremely low self-esteem etc encourage your mentee to continue thinking about it before doing anything rash and then contact your case manager for more specific advice and services. Labels: influence, Parents, piercing, relationships, What do you think? Carlo loves to play video games, and even though he is only 11 years old he just got Call of Duty 3 as a birthday gift from his uncle in November. Ever since he has been obsessed with the game and plays it all day after school. His parents don’t pay much attention to his gaming, or to him, because they both work so much and he has two younger siblings that occupy their free time. They let him have the video game console in his room so that he wouldn’t bother them. How is Carlo’s gaming affecting his life and the other people in it? Why do you think he games so much even though he knows it is bad for him? Do you think the violent nature of his new game caused him to be more aggressive in pushing that boy? Why or why not? Do you think there are any benefits to playing video games? If so what might they be, and when might they outweigh the negatives? How might Carlo’s parents have helped create this problem and what could they do to turn it around? ** Video games are a highly effective learning tool for children because they engage attention, repeat actions, and offer rewards for success. Research shows that this learning can be positive or negative depending mostly on the amount of time spent playing and the level of violence/mature content. 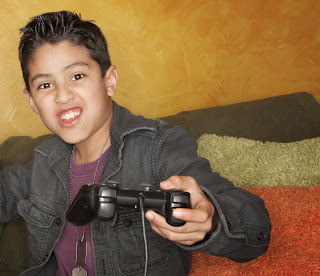 ** According to a national study 92% of children ages 2-17 play video games. And boys ages 8-13 play the most, averaging almost an hour a day. This study also shows that African American and Hispanic youth play more videogames than white youth, and low income youth play more than high income youth. ** Another study shows that 89% of the most popular games contain violence, and half contain serious violence. ** Video game addiction is real and like any other addiction is used to escape from an unhappy reality and feel a sense of control. Playing video games for hours every day to the point that it negatively affects other areas of their life means they are addicted and need help. ** Talk to your mentee about the video games they like to play and how much time they spend playing. Ask them if they think it affects them in any way and discuss the pros and cons. ** Try playing a game with them to get an idea of the content so that you can talk about it with them and let them know how you feel about it. Playing with them will also give them a chance to be better than you at something (probably) and will be a self-esteem boost if nothing else. ** Encourage your mentee to spend time doing other activities, or at least play games with more educational value and less violence (civilization vs call of duty). ** If you notice your mentee is more aggressive after playing video games talk to them about it, they might not even realize it is affecting them. ** But most importantly, while you are talking about video games try to see it from their perspective and understand the appeal of video games, otherwise they will write off your advice. Labels: addiction, bully, gaming, homework, video games, violence, What do you think? Steve just moved to a new school this year. He is meeting new friends and becoming more and more popular. One day at lunch, his friends are talking about Billy’s party on Friday. They invite him and tell him it is a “Pharm Party” (Pharmaceutical Party). Steve is a little confused on what that is so he asks his friends about it. They tell him just to grab some pills from his parent’s medicine cabinet and bring them with him on Friday. Friday comes along and Steve has three containers of pills. He doesn’t know what they are. Steve gets picked up by his friend and his friend’s mom and they head to the party. She drops them off at Billy’s house with pockets full of pills. They go inside, are handed a beer, and then they all sit around in a circle with a bowl in the middle. Everyone starts dumping in all their pills into the bowl. Billy mixes the pills and then tells everyone to take a couple and swallow them with their beers. Steve looks down and stares at the bowl not sure what to do next. What would you do if you were Steve? What are the pros and cons of each path he could take? What do you think are potential consequences of mixing different prescription drugs and alcohol? Could Steve or his friends die from doing this type of partying? Considering how dangerous it is, why do you think the teens are participating in this type of partying? What do they gain from it? Is it worth it for Steve to take a risk just to be popular? Could he turn down the pills without offending his new friends? If so how? How would his parents feel if they found out he not only stole their pills but then went to a party like this? What if he or someone else was disabled or killed by taking their drugs? Could his parents get in trouble with the law for that or would it be Steve’s fault? ** The new term "Pharm Party" refers to a party where prescription drugs are readily available in a potentially deadly mixture. The term "Pharm" is short for pharmaceuticals, which includes such drugs as Xanax, a strong tranquilizer and powerful pain killers like Vicodin and Oxycontin. Often times mind altering psychotropic drugs like Zoloft, Prozac, and Wellbutrin, commonly advertised on television, are taken in concert with other powerful pain pills and tranquilizers at these pharmaceutical cocktail parties. Pharm party goers often refer to this potentially lethal concoction as "trail mix". The "trail mix" is usually served up in large bowls or baggies and handed out to guests in the same fashion as a hostess serves snacks and drinks at a cocktail party. ** Columbia University's National Center on Addiction and Substance Abuse notes that about 2.3 million kids, 12 to 17, took prescription drugs illegally in the past year, based on 2003 figures. That's a 212 percent increase from the early 1990s. ** Part of the allure of prescription drugs is that they can be easier for kids to get than illicit drugs. Some trade on their own prescriptions (obtained legitimately or by faking symptoms), while others steal from family members or order drugs from online pharmacies. ** Experts note that "pharming parties are a new social twist that contributes to the growing problem of prescription drug abuse, which has worked its way into pop culture via message boards, song lyrics and even T-shirts." 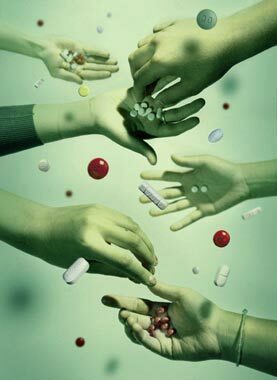 ** The fact that kids often alter the ways these drugs are to be taken increases the risk even further. For example, they may crush the pills to achieve a quick high, even though many of these medications are meant to be slowly absorbed into the blood stream. That leads to dangerous changes in heart rhythm and much more. ** The problem isn't just that kids can easily become addicted to painkillers like Oxycontin or Vicodin, antianxiety medicines like Valium or Xanax, or attention-deficit-disorder drugs like Ritalin and Adderall. Taken without proper supervision, those medicines can send kids to the emergency room. They can lead to difficulty breathing, a drop or rapid increase in heart rate or trouble responding when driving a car, especially when the drugs are combined with alcohol, as they often are. ** Experts of Columbia University's National Center on Addiction and Substance Abuse say that of 9.4 million teenagers, 40 percent believe that prescription drugs are “much safer” than illegal drugs. Nearly three out of 10 teens also believe that there is “nothing wrong” with using prescription drugs without a prescription. ** Wrongful use of medicines can cause permanent physical disability as well as interfere with normal brain development. ** Do an exercise with your mentee. Bring a pair of glasses and have them try them on. Maybe even attempt to take a few steps. Let them know that it's a prescription, designed just for you (or whomever you borrowed them from), and that they're not for everyone, just like prescription medications. They can make you dizzy, fall down, feel out of place. You'd give them to someone else who lost their glasses, thinking it works for you, but it may not work for them in the same way. It's best to not take something that wasn't designed for you. ** Talk with your mentee about drugs and alcohol early and often. It’s always better to prepare them before they ever encounter it. Talk to them about the reasons why a person could choose to use drugs, and go over the consequences, and how they can powerfully destroy lives and families. ** Get educated on the subject of pharm parties and talk to your mentee about possible consequences of taking pills without a prescription, and especially mixing pills. ** Ask your mentee what he/she knows about pharm parties and if she/he has an opinion about it. ** Talk to your mentees about peer pressure and make them realize how making the wrong choice could have dangerous consequences. Advise your mentees about having personality and not simply doing what others consider to be cool. Help them come up with different things to say to get out of doing drugs without losing face with their friends. Role play to practice so when the time comes they don’t have to think about it. ** Make sure your mentee knows the warning signs of an overdose, so if they are at a party and a friend is in trouble, they'll know what to look for and what to do...call 911. Remind them it's better for their friend to stay alive and get in trouble than to know that they could have saved them...and didn't. They should turn them on their left side, check for breathing, see if they are responsive when you force open their eyes to see if the pupils change size. ** Here are several of the most successful ways for a teen to turn down drugs, ask your mentee which one sounds good to them and practice it with them. 4. "I'd rather not spend the entire night on the toilet if it's a diuretic." ** If your mentee is abusing prescription drugs encourage them to seek treatment, and then contact your case manager to discuss options. You can say something like, "I've noticed some changes. I'm concerned and I'm worried and I'd like to help you get help." Approach it from a point of caring, rather than accusing. A 2010 22-year-old UCSB graduate went to a grad party. After about 4 or 5 drinks, he was offered a Xanax, which he took. Not long after, someone came up to him and said, "Hey, you gotta try this awesome new drug." Buzzed off the drinks and the Xanax, he didn't really think before taking the offer. He soon fell asleep, and his friends thought he'd just sleep it off. When he wouldn't wake up after a while, his friends called an ambulance. Thankfully he was young, so he didn't die. BUT all 4 major organ systems were affected. The concoction in his system cut off the flow of oxygen in his blood; he forgot to breathe and all his pain receptors were numbed. He suffered a minor stroke with kidney and liver damage. Thankfully he survived, but not everyone is so lucky. Labels: abuse, alcohol, drug abuse, drugs, friends, party, peer pressure, pharming, pills, prescription drugs, Rx, What do you think?